Lightweight sweaters have long been a style staple, and the layered look remains prominent on this season’s runways. From ready-to-wear brands to luxury labels, sweater styles are constantly being updated by designers to take on trends and remain relevant for active lifestyles. While a basic lightweight sweater is easily accessible in shops and online year round, we are particularly keen on snagging pieces that are unique, top quality and sure to sell out. 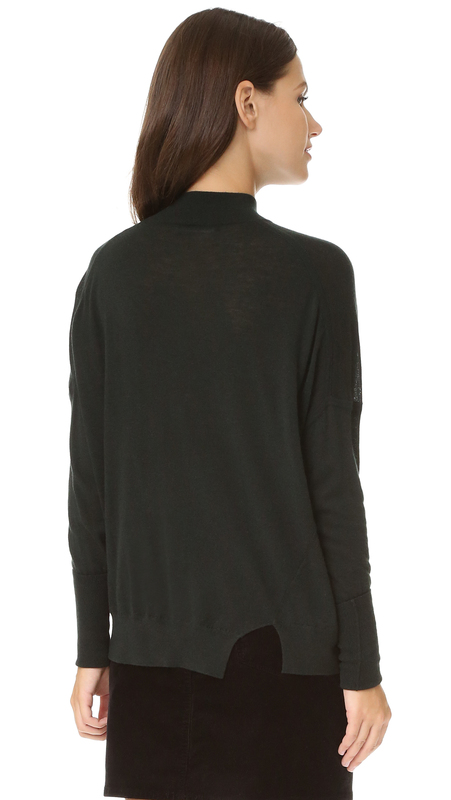 The Acacia turtleneck sweater by J Brand is just that. Designed in a way that is the perfect balance between a top and wrap, the Acacia sweater drapes into an oversized silhouette that is both comfortable and feminine. The tissue-thin fabric is made of 100% merino wool, making for a semi-sheer look that’s easily layered with camisoles or coats. A turtle neckline sits above the long sleeves that rock dropped shoulders and extended cuffs for that slouchy look we love. An asymmetrical notch at the hem adds some trendy texture for a fabulous finish. Even with the edgy updates, this sweater is still a classic, and guaranteed to work with pieces already in your wardrobe. Virtually any denim will work with the Acacia sweater, making this an amazing piece for looking put together on days you’re running late. When you have a little extra time, embellished cuff bracelets, watches and dainty jewelry would all look equally chic with this top for a more dressed-up vibe. Finish off your outfit with Chelsea boots, sneakers or over-the-knee shoe styles for a polished look that goes from the office to happy hour effortlessly. Get ready to be stylish in a snap.